The Ultimate Modular Storage System H - 206mm D - 168mm Total Length - 600mm.. The Ultimate Modular Storage System H - 165mm D - 133mm Total Length - 600mm.. The Ultimate Modular Storage System H - 114mm D - 92mm Total Length - 600mm.. The Ultimate Modular Storage System H - 84mm D - 63mm Total Length - 600mm.. Heavy duty - 75Ib safe working load Mounting hardware included..
Folds up flat against the wall when not in use. Heavy duty - 50Ib safe working load. Mounting hard..
Max weight 60Kg Screws not included..
Max 85Kg Screws not included..
Max weight 40Kg Screws not included.. Heavy duty - 50Ib safe working load Mounting hardware included.. Grips up to 1.5" 5Ibs safe working load Screws included..
Max weight 25Ibs Screws not included.. Holds up to 65Ibs Screws included..
20Ib safe working load Screws included..
Solves storage problems in the home, garage, shed, cellar & workshop. Screw included.. Length x Width 37.5 x 18 (inches) 950 x 460 (mm).. Safe, secure storage for valuable and/or dangerous products. Includes one way security screws. Loc..
Poweful magnets hold tools securely Heavy duty carbon steel Complete with fixings Lengths - 203, ..
Raaco 616-123 blue metal cabinet with 16 assorted drawers: 12 x 150-01, 3 x 150-02 and 1 x 150-03. T..
Racco 928-123 blue metal cabinet with 28 assorted drawers. 24 x 150-01, 3 x 150-02 and 1 x 150-03. T.. Length x Width x Depth 6.5 x 4 x 3 (inches) 165 x 100 x 75 (mm).. Length x Width x Depth 9.5 x 5.75 x 5 (inches) 235 x 145 x 125 (mm).. Length x Width x Depth 13.5 x 8 x 5 (inches) 350 x 200 x 125 (mm).. Length x Width x Depth 13.5 x 8 x 7 (inches) 350 x 200 x 180 (mm).. Length x Width x Depth 15 x 16 x 7 (inches) 380 x 400 x 180 (mm)..
A robust steel cabinet with 44 drawers. Made from impact proof plastic. It can stand alone or be hun.. The Raaco 55x4 is a Handy portable carrying box, complete with: 2 x PSC 4-15 : Profi Service Box ..
4 per pack with 11" Bar. Slide to desired position. Screws included.. 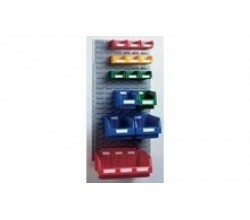 This Faithfull 43 piece wall mounted storage system is a quick and easy way to organise tools, fixin.. This set of Faithfull 24 plastic storage bins with a metal wall panel is ideal for workshop, garage .. Saves space by swiveling 180 deg Screws included..
Max weight 120Kg Screws not included..